We’ve had several overnight frosts, and the Alaska winter will be upon us soon. As we batten down for the cold months ahead, we pause in prayerful thanks for your generous support and for your prayers. Thank you so very much for your kindness. Without your help, our work would quickly cease to exist. We pray that you will be rewarded many fold. Inside this issue, you'll find several extra pictures that our four-page paper "Nome Static" couldn't handle. We hope that you enjoy them. Thank you again! 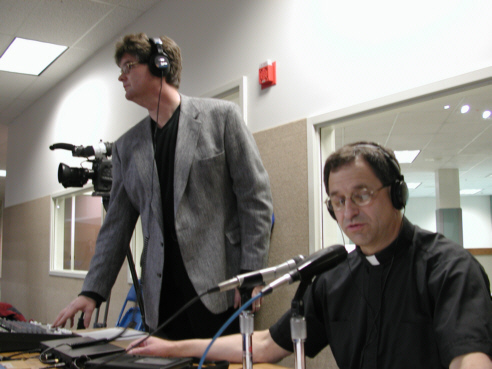 ORDINATION: (left) Former KNOM volunteer and long-time Fairbanks broadcaster Peter Van Nort directs radio coverage of Bishop Donald Kettler’s ordination Mass, while KNOM spiritual director Fr. Mark Hoelsken, SJ provides commentary. A thousand worshipers packed Fairbanks’ Carlson Center arena for the ceremony August 22nd. Fairbanks is the seat of our diocese, though it’s 520 road-less miles from Nome and even farther from many of its village parishes. Only a handful of “bush” Catholics were able to take part in person. However, thanks to KNOM’s signal, thousands scattered throughout western Alaska were able to worship along with the deeply moving two-hour ceremony via radio. The ordination was probably our most listened-to program of the year. Bishop Kettler was ordained by Most Rev. 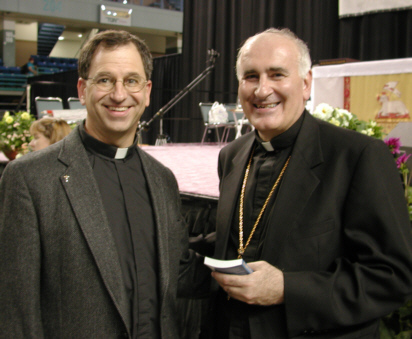 Roger L. Schwietz, OMI, Archbishop of Anchorage. The ordination was attended by fifty-five priests, thirty-two religious sisters, brothers and deacons, and eleven other bishops, including Most Rev. Gabriel Montalvo, JCD, Apostolic Nuncio to the United States and the Rt. Rev. Nikolai, Russian Orthodox Bishop of Alaska. Thank you for making our broadcast possible! 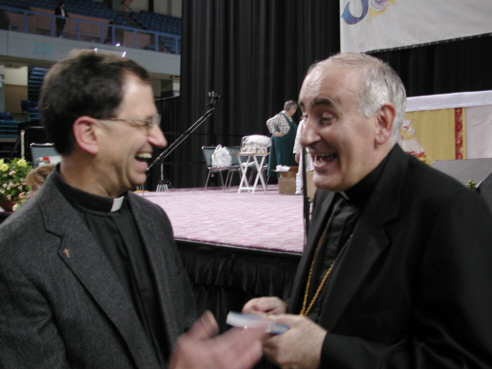 (Left) Father Mark and Bishop Kettler share a laugh following the ordination, and then pose more formally. INSPIRATIONAL SPOT: Thank you, Lord, for those who do all the little extras, those who do volunteer work for the children, teachers who work extra to help their students, those who work for God and reach out as far as they can. And thank you for those whose extras I will never know. Kate, home on vacation from college in Montana, often lends a voice to Mike’s spots. The series produced in Studio C this August day was intended to discourage young people from trying drugs. SMALL FRY: Across Alaska, a dry summer fueled fires that burned two million acres. 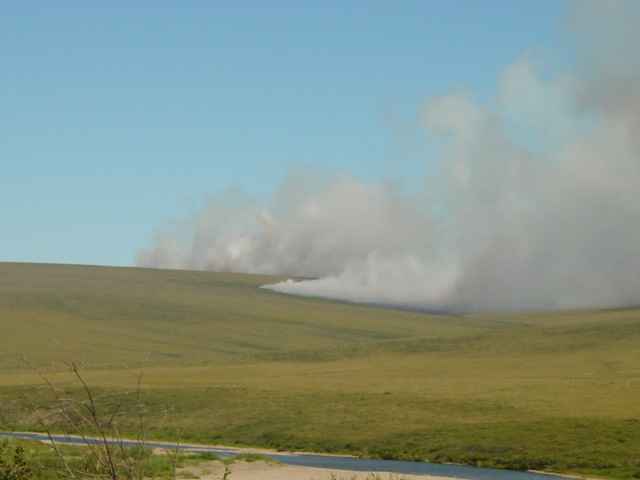 The closest blaze to Nome was a little 10,000-acre tundra fire that started when the hot muffler on a pickup truck ignited dry grass. The truck was destroyed, but noboby was hurt, and the fire fizzled before reaching any cabins. Left: volunteer Tim Bodony took this image from the nearest road when the fire was only a quarter its eventual size. FREEZE! The morning of August 13th brought the first frost of the winter season to Nome. APPLY TOPICALLY: Our signal blankets 100,000 square miles of western Alaska, reaching dozens of remote Eskimo and Athabascan Indian villages. It’s a region of endemic poverty, with problems like alcoholism, domestic violence and suicide at horrifying levels. One solution to these ills is education, and KNOM devotes hundreds of hours a year discussing important issues and interesting news. Among topics we’ve covered recently: inhalant abuse, summer college programs for high school youth, repatriation of native remains, seatbelt safety, regional gold mining, fisheries development, beach erosion, local youth programs, employment and training, emergency medical services, village education and ivory carving. Thank you for making these programs possible! AH, YOUTH! 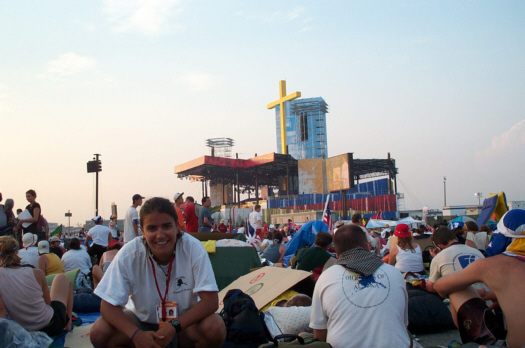 For KNOM volunteer Julia Arrotti, the twelve days in Toronto for World Youth Day were tough, camping at night and enduring, for Alaskans, brutally hot temperatures. (Left) Here's Julia, just before the evening vigil. Though not visible, Pope John Paul II is in the background. 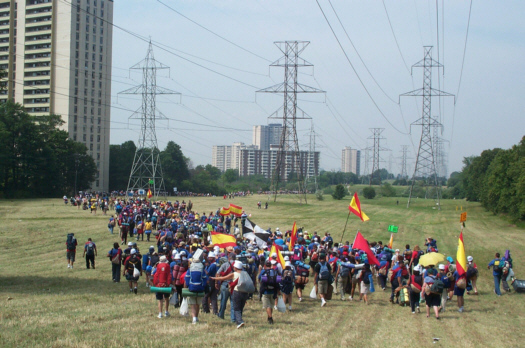 (Left) Walking in the heat and humidity was arduous for the forty youth pilgrims from the Diocese of Fairbanks, but “seeing and hearing the pope in person was a deeply emotional experience,” she says. 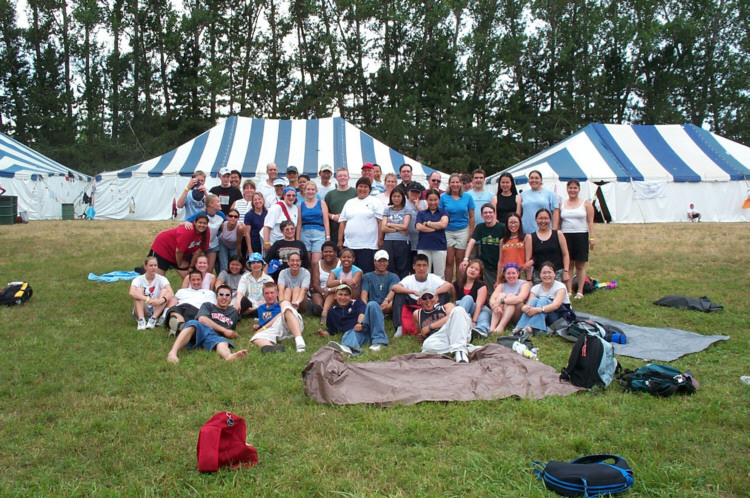 (Left) Here's a group photo of the Alaskan youth and their chaperones. Young and old alike slept in the blue-and-white striped tents, visible in the background. Julia produced daily news reports and several inspiring interviews, with all expenses paid by an anonymous donor, whom we sincerely thank. (Left) A Toronto television station interviews Yup'ik Eskimo youth from the village of Tununak (tuh-NOO-nuk). According to Julia, being interviewed "was just the coolest thing for those kids." INSPIRATIONAL SPOT: If you found a gold locket with the owner’s picture in it, would you return it to her? Look in the mirror. We see the image of our Maker. Shouldn’t we return to Him, too? top WE HAVE CONNECTIONS, thousands of them inside our 25,000 Watt transmitter. 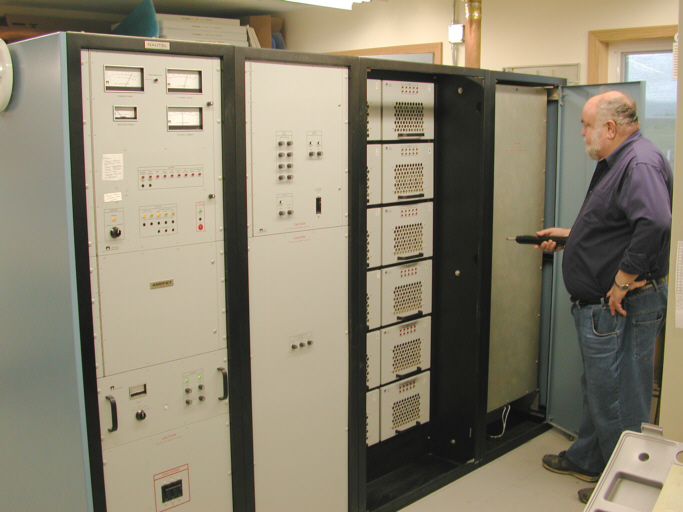 Once a year, Les Brown (left) and Tom Busch, both engineers, take the transmitter off the air and gently take it almost completely apart. They check every bolt and nut to ensure that everything is nice and tight. 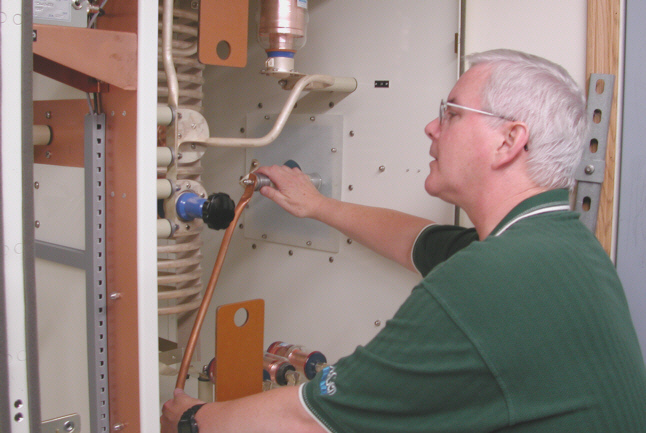 Left: After triple-checking to make sure it’s safe, Tom examines the high voltage “antenna tuning unit” for signs of heating, which can indicate trouble. The copper tube he’s checking feeds the antenna and normally holds about 5,000 Volts. The transmitter system has worked without a single failure for over five years, partly because the KNOM crew take such good care of it. 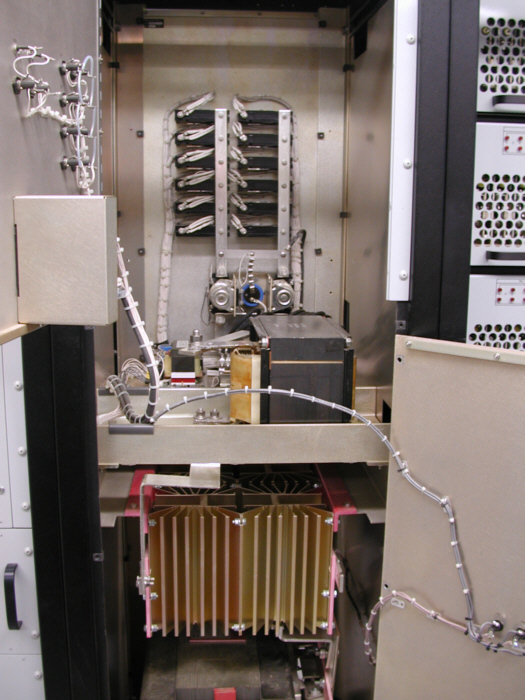 Left: This is the inside of one of the transmitter cabinets, the power supply which produces up to 700 Amperes of current that fuel the 25,000 Watt signal. Ordinarily, this cabinet is buttoned up tight. 30 YEARS AGO: Nome saw its first winter snow on September 14th, 1972. That month, the mission’s Siberian husky “Thunder” was critically injured. Hoping to evacuate the animal to Anchorage, volunteers Tom Busch and Richard Gembler drove onto the airport runway as the evening Alaska Airlines 727 was taxiing for take off. The jet stopped and from the cockpit side window, the pilots informed the KNOM’ers that the plane was carrying a human patient and could not be delayed. Imagine what would happen to someone who chased after a jet today! top “FAIRS FARE”: In autumn, volunteer recruiting fairs are standard fare for Tom and Florence Busch at Catholic colleges throughout the country. We are looking for “the best of the best,” and beyond that, young people whom we judge will succeed in the remote, isolated environment of Nome. On the average, we accept about 15% of applicants. 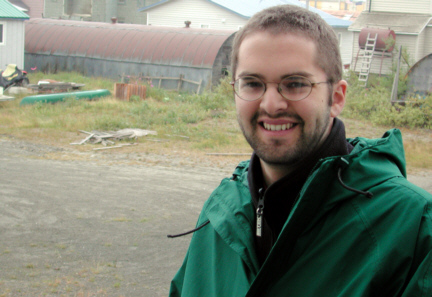 FAREWELL: It’s that difficult time of year when volunteers depart Nome for the outside world. In September we bid farewell to KNOM volunteer Tim Bodony (upper left). Tim produced programs, news reports and feature interviews, and served as music director for his final few months. Also in September, we said goodbye to volunteer Julia Arrotti (left), a dynamic KNOM news reporter. Also departing was KNOM volunteer news reporter John Hall (below, left). These volunteers are talented and hardworking, and we know that you would immensely like each of them. Please join us in prayer for future success for these absolutely wonderful, generous young people, who left Nome with our sincere thanks. Again, we thank you sincerely for your support for our work, and we are especially grateful to you during these turbulent economic times. Your prayers and your financial help keep America’s oldest Catholic radio station strong and well, beaming inspiration and education into many scattered Alaskan villages. May Our Lord richly bless you for your kindness. INSPIRATIONAL SPOT: Protect it. Pray for it and give generously to it. Forgive for it. Bring the fullness of your love to it. Your marriage is worth all of this, and much more.